The AK-74 signified the Soviets’ response to the West’s M16. (Main) Shown is a wooden-stocked Bulgarian variant that has been custom built as a U.S.-legal semi-auto rifle. 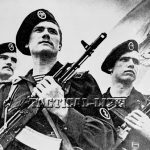 (Inset) Soviet naval infantrymen armed with AK-74 rifles. 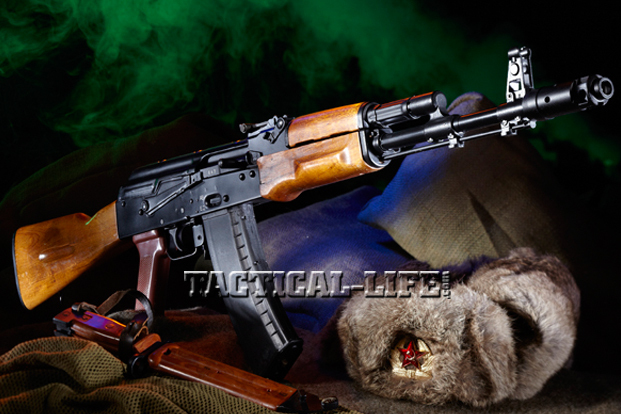 The heart of the custom AK-74’s build was the U.S.-made, stamped sheet-steel NDS-2 receiver manufactured by NoDak Spud. 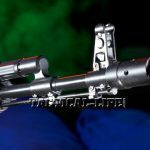 One of the most visually distinctive traits is the muzzle brake comprising a large cylindrical tube with an internal beveled diaphragm. Due to the U.S.-made parts used in this build project, the rifle was able to feature the kit’s original, reddish-toned, synthetic pistol grip. 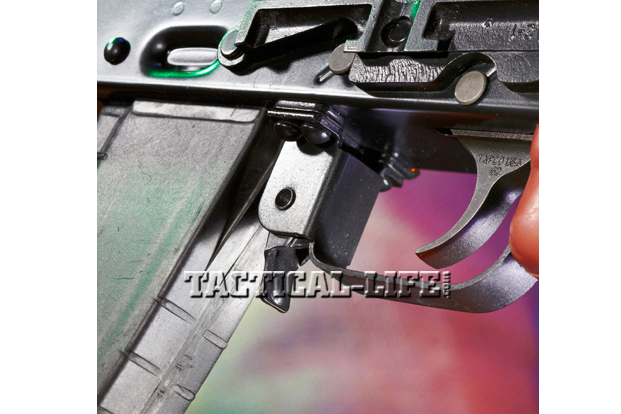 The builder used a TAPCO Intrafuse G2 single-hook trigger group. Note the paddle-style mag-release lever forward of the triggerguard. The AK-74 signified the Soviets’ response to the West’s M16. 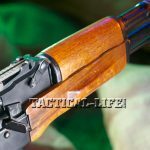 When Mikhail Kalashnikov’s AK-47 first appeared in the late 1940s (and later evolved into the now commonly seen AKM), it clearly heralded a new way of thinking in small-arms design. Combining an “intermediate cartridge” (the M43 7.62x39mm round) with a detachable box magazine, the Soviet AK melded the best characteristics of the full-power rifle with those of the submachine gun. However, as with any technological development, in time it began to be superseded by competing designs. 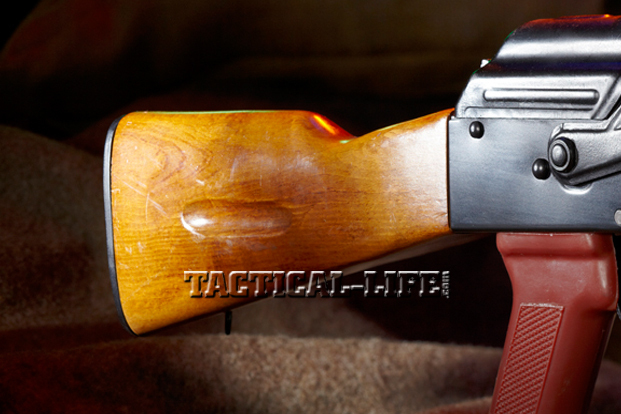 In the AK’s early years its primary Western competitors were the M1 Garand and then the M14. The former chambered the gargantuan (by comparison) .30-06 cartridge, while the M14 chambered the slightly shortened but still extremely powerful 7.62x51mm round. Due to their power, they were not practical for anything but semi-automatic fire. Although the M14 did have a selector switch, the cartridge’s recoil made the rifle practically uncontrollable past a few rounds in full-auto. It was the M16’s introduction in the 1960s that established a new paradigm in small-arms design. Revolutionary in concept from beginning to end, the M16 heralded not only the use of ultra-modern materials (alloys and synthetics rather than just steel and wood) but also the West’s new intermediate cartridge, the 5.56x45mm. Paired with the M16, the new cartridge offered controllable full-auto firepower in a light and handy package. After examining samples of the M16 captured in Vietnam, Soviet engineers recognized that the performance capabilities of the new 5.56x45mm outpaced those of their 7.62x39mm. Whereas the latter cartridge’s velocity and trajectory caused it to have significantly degraded performance past 300 yards, the 5.56x45mm (which moved a 50- to 60-grain projectile in the eighborhood of 3,200 feet per second [fps]) performed well out to 600 yards, all with lighter ammunition weight and lower recoil. As a result, the Soviets set about developing a comparable cartridge. Some in the upper echelons of the Soviet defense industry had already been considering “refreshing” the AK and its cartridge—the M16’s arrival simply accelerated their plans. After a great deal of research, testing and comparison against captured 5.56x45mm rifles and rounds, the new Soviet cartridge to emerge was the 5.45x39mm M74 (indicating its year of appearance). Propelling a lightweight 50- to 60-grain projectile at around 3,000 fps, the new round appeared to answer all the required design parameters for the new round: flat trajectories, low recoil and lightweight ammunition. But what weapon would host this new cartridge? Although there were rumblings about developing a new platform, particularly in light of the radically modern M16, the tried-and-true AKM was considered too well established and reliable a weapon to discard. As a result, engineers (including the design’s father, Mikhail Kalashnikov) set about adapting the AK to fire the new round. In the mid 1970s and after a great deal of work, including optimizing barrel life for the much faster cartridge, they had developed the AK-74. As opposed to the M16, the AK-74 rifle followed a more traditional approach to weapon design. 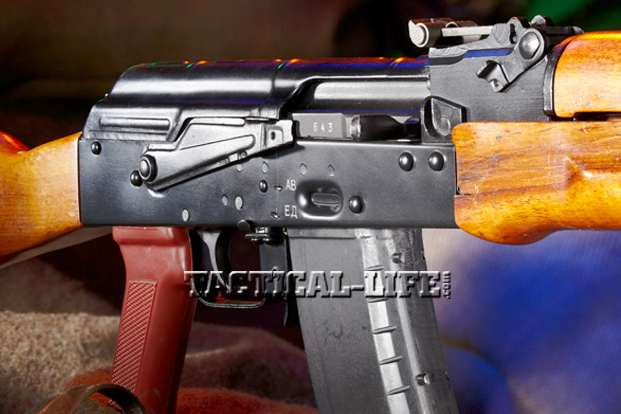 Externally similar to the AKM, the AK-74 built on the strengths of the 1960s-era AKM update of the AK. Although there were significant internal modifications (including modified bolt heads, recoil spring systems, improved extractors and so forth), the AKM and the AK-74 were externally very similar. They also shared the same ultra-reliable long-stroke gas-piston system. 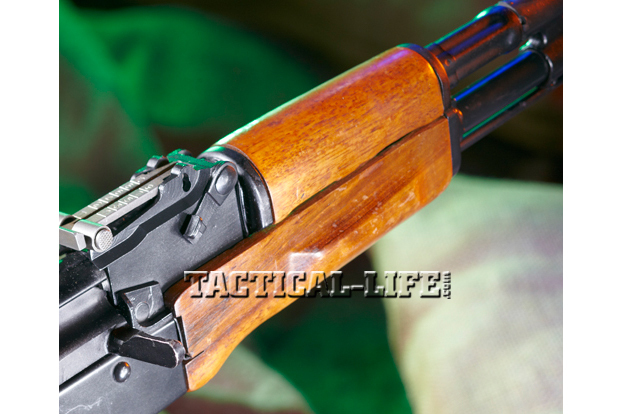 Despite their similarities, there are some visual clues to the true nature of the AK-74. The most notable is the 74’s muzzle device. Whereas the AKM’s threaded muzzle usually sported a muzzle nut or a low-key “slant” brake, the AK-74’s muzzle employs a large cylindrical muzzle brake. Although manufactured in different variations over the years, the brake design in general is an elongated tube with openings cut on each side at the front. Internally it features twin chambers: The first features an expansion chamber and gas escape ports, while the second corresponds with the large forward side ports and has a beveled diaphragm through which the projectile passes. These beveled areas direct gasses rearward, pushing the rifle forward against recoil. The result was a muzzle brake that minimized the already low recoil of the 5.45x39mm cartridge. 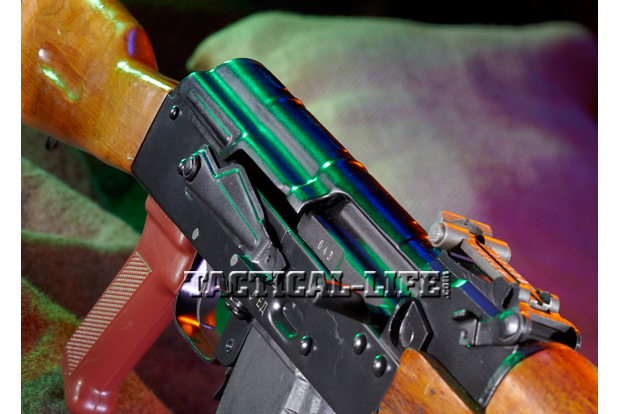 In addition to the muzzle brake, the other most notable indentifier of the AK-74 is a long horizontal groove cut into each side of the laminated buttstock, as well as a ribbed buttplate. 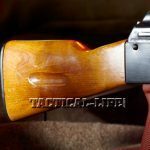 Although there is some argument over the purpose of the horizontal groove (some argue it is a lightening cut), the consensus seems to be that it was intended as both a visual and tactile clue to the identity of the rifle as a 5.45mm rather than a 7.62mm. 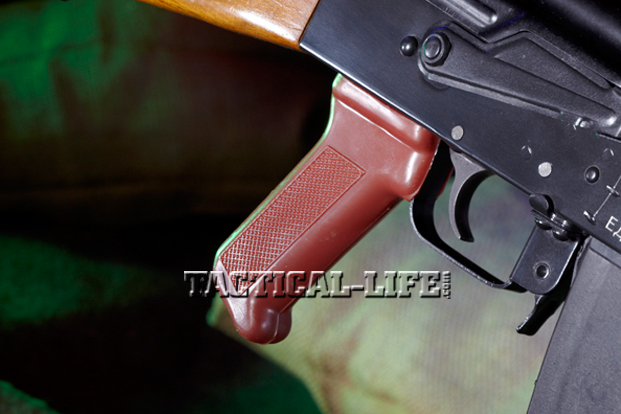 The AK-74’s forend features an AKM-style lower handguard with hand-filling, bulged protrusions on each side. Later variants would feature polymer stock sets, taking advantage of Soviet advances in the production of modern composites. The final visual clue to the AK-74 is its magazine. Whereas the AK-47 and early-era AKMs employed heavy-duty steel magazines, the AK-74 employed magazines with a composite body (for resistance to the elements as well as lighter weight). The earliest versions of these featured a dull reddish-orange color that was very distinctive. Another more subtle change was that the earliest AK-74s featured a 45-degree-angle gas block like the AKM. 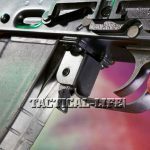 Shortly thereafter a 90-degree gas block was developed, as it was determined that it helped reduce the effect of bullet shearing. I have been told that there was a saying in Bulgaria: “When it rains in Moscow, Bulgarians take out their umbrellas.” This reflected how, during the Soviet era, Bulgaria was one of Russia’s most closely aligned “satellite” states, and in examining the small arms produced by Bulgaria, that would appear to be accurate. Numerous variants of the AK were domestically produced by the Soviet Union’s affiliated states, and some hewed much more closely to the original designs. The AK variants produced by Bulgaria’s Arsenal, a manufacturing conglomerate dating back to 1878, are generally patterned closely after the Russian originals. 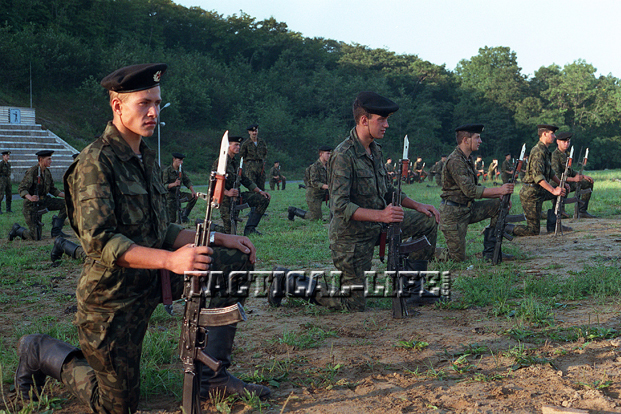 Bulgaria has been upgrading and modernizing its military equipment, and as a result the U.S. market has recently seen a steady supply of parts kits made from demilled Bulgarian AK-74 rifles. 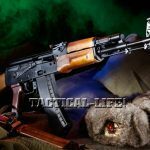 Available in both wood-stocked and polymer-stocked variants, these parts kits offer the AK-74 enthusiast a chance to own a rifle that is reasonably similar to the original Russian AK-74. 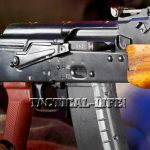 In fact, while perusing Apex Gun Parts’ website to see what might be available, I found a Bulgarian AK-74 parts kit with a wood stock set. It featured all the parts except for the barrel, receiver and magazine. I immediately put in an order. 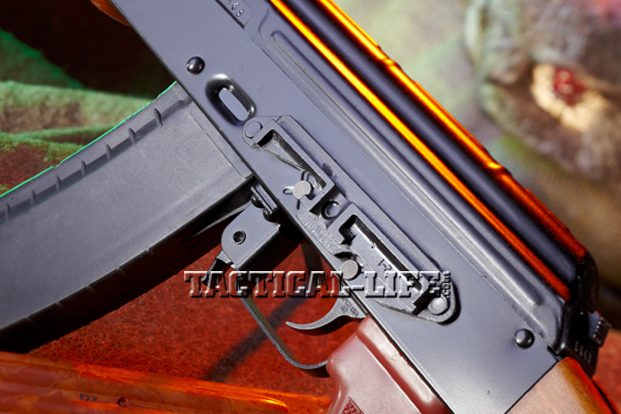 Although the AK may be a simple design, it is not necessarily simple to manufacture. All its characteristics that make it a straightforward design do in fact require a great deal of skill and experience (as well as the proper equipment) to manufacture. I knew I had to contact a skilled builder to put this project together for me. Going on my prior experience with his excellent work, I contacted Troy Sellars, a highly skilled custom-gun builder and owner of In Range, Inc. Sellars builds guns with customer-provided parts, to their desired requirements. He does not stock AK parts and does not currently stock any complete rifles. 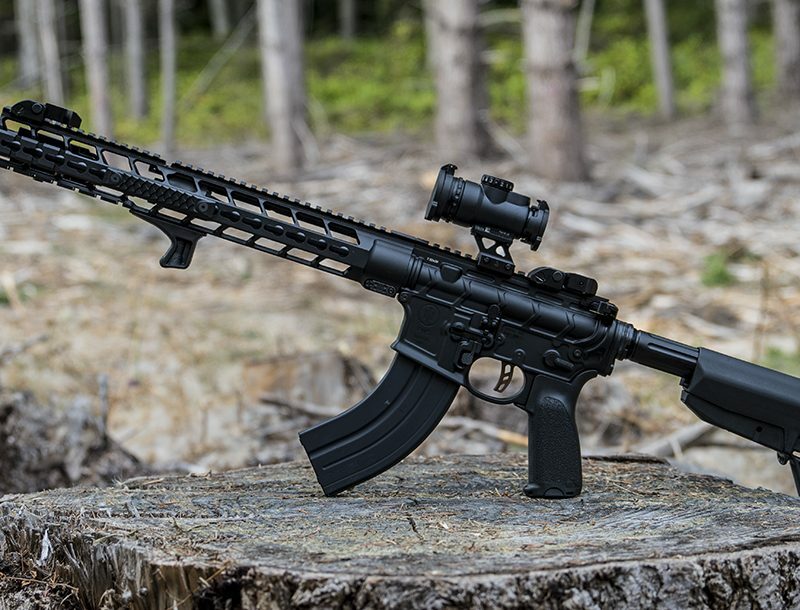 With any build from a kit that was once a foreign-made, select-fire weapon, there are some legal issues that must be addressed.During a quick phone call regarding the project, we discussed building the rifle to conform with Sec. 922(r) (visit atf.gov for more information). As the AK-74 is a stamped-receiver design, we were looking at a total requirement of six U.S.-made parts to achieve 922(r) compliance. The kit obviously did not include the original receiver or the barrel, so those two were good candidates for U.S.-made parts. With a little research, I located a Green Mountain Rifle Barrel Co. barrel as well as a NoDak Spud NDS-2 stamped sheet-steel receiver, which is patterned after the Bulgarian SLR-105’s. With two down, we had four to go. To keep the external look of the rifle as original as possible, Sellars suggested that the final parts be a trigger group (made up of a trigger, hammer and disconnector) and a new gas piston. I contacted TAPCO and picked up one of the company’s Intrafuse G2 single-hook trigger groups and one of its stainless steel gas pistons. This brought me up to six U.S.-made components and allowed the finished rifle to use the entire original stock set and muzzle brake. Although I had addressed the U.S.-made parts requirements of the rifle, I remembered that the kit did not include a magazine. 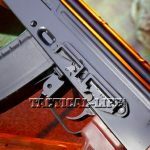 Sellars recommended I check Arms of America, which has a thorough selection of AK parts, parts kits and accessories. There, I was able to find not only an excellent condition 30-round black Bulgarian AK-74 magazine but also an excellent condition Bulgarian AK-74 bayonet. Sellars informed me that once he had all the parts, I should expect at least a three-month wait for him to complete the build. He gave me some details on how he builds the guns, and also informed me that it would feature a baked KG Teflon Moly finish over phosphating for rust resistance. So, I moved on to some other projects and tried to put this out of my mind to ease the wait (not very successfully, by the way). About 12 weeks later, I received an email from Sellars letting me know the rifle was on its way to my FFL. He told me that the original kit was in such good condition that he left as many of the parts with their original finish as possible (including the bolt carrier with its silver-color highlighted serial number). When I picked up the rifle at the shop, I was immediately impressed. 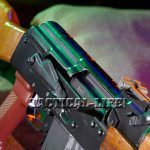 The stock set, which had a blonde tone, was in outstanding condition, with only a few blemishes and featuring the correct AK-74-style ribbed steel buttplate. 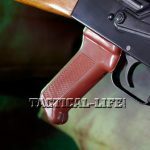 The original pistol grip featured an orange-red hue that matched up nicely with the light-colored wood. When I got the AK-74 back home, I broke it down and gave it a close inspection. All the rifle’s controls worked smoothly, the synthetic Bulgarian magazine was easy to insert and remove, and the action cycled very smoothly. 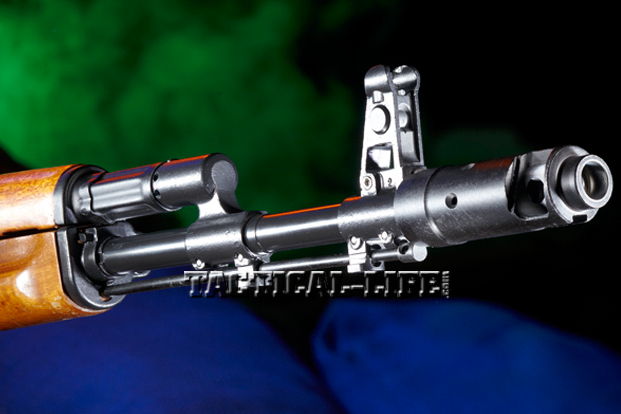 A side-mounted rail for optics was also included with the rifle. 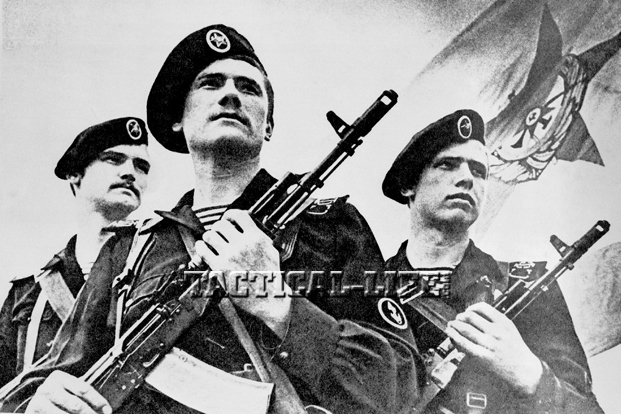 I noticed that the AK-74 had been given Bulgarian-style Cyrillic markings on its safety positions, which included safe, fire and a false middle full-auto position. These markings had the same silver hue as the original serial markings. It was clear that a great deal of attention was put into the construction of this rifle. I headed out to the range with some Hornady V-MAX 5.45x39mm, 60-grain, steel-cased ammunition and settled in at the bench with a target set at 100 yards. 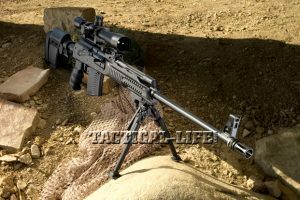 Accuracy was extremely good, with groups averaging 2.6 inches at 100 yards and a tightest group of 1.7 inches—all in all very impressive for an iron-sighted Kalashnikov. These results were likely due to the combination of the very low perceived-recoil and a pretty good 4.25-pound trigger pull. After I finished up the accuracy testing, I ran multiple shooting drills with the magazine loaded to its full 30-round capacity. Over the span of a few hundred rounds, the rifle ran without a hitch.